Jacob b. Jehuda of London, the author of that valuable contribution to the literary side of Anglo-Jewish history, the Talmudical compendium Etz Chaim, so providentially rescued and preserved for us, never dreamt, when he noted down, in the year 1287, the Ritual and Agada of the Seder Nights according to English usage, that he was fixing a permanent picture of what was doomed to destruction, and was recording not a mere portion of the liturgy, but a page of Jewish history. Faithfully copying his great prototype, Maimonides, the English Chazan also embodied in his work the texts of the Recitations on the Seder Nights in the form customary among his countrymen, and appended the correlated rites according to Minhag England. The Hagada has hitherto been considered the piece, par excellence, common to all the liturgies, and bearing the least and fewest marks of national differentiation. The examination of our MS. shows, however, that this part of the Service reflects as clearly and unmistakably the characteristic independence of the English liturgy, already noted in a previous article, as the rest of the prayers. Notwithstanding its small bulk, several variations distinguish and mark it off from the French ritual. Thus, for example, the repetition, in the vernacular, of the first two pieces, before and after the second cup—which, we learn from Rashi’s Pardess was the French usage—was not customary in England.Solomon b. Jehuda, the saint of Dreuæ (see Gross, Revue des Études Juives, XIII, 46, No. 3), followed this custom of translating the Hagada into the vernacular, so Samuel of Falaise reports, as quoted by R. Isaac, Or Sarua, 119a והקדוש מדרי׳׳וש היה רגיל לומר בלע׳ז עד כולנו מסובין. Had it been so, how valuable would the English renderings from the pre-expulsion period have been to us. Or, perhaps, they too would have been in French. The single non-Hebraic term which R. Jacob gives in his Ritual of the Seder, cerfeuil, the name of the vegetable handed round after the first cup, is French, and is met with in authorities of French origin or descriptive of the French ritual, e.g., in the Machzor Vitry (ed. Hurwitz, p. 294: ויקח מן הצרפוייל). In the third part of his Hilchot Pesach, R. Jacob gives detailed instructions for the preparation of charoseth. But we look in vain in his work for a translation of the term, though such is given in Zidkiah b. Abraham’s שבלי הלקט (ed. S. Buber, p. 184). חרוסת אינה מדברי סופרים זכר לטיט וככה מעשהו יקח תמרים או גרוגרות או צמוקין ורורסן ונותן בם חומץ ומתבלן בתבלין כס׳ טיט בתבלין ונמצא במדרש לעשותו מכל פירות של שיר השיריםOr Sarua, II., 119b. תמרה תאנה רמון אגוז תפוח ויוסיף שקדים ששקד השם על הקץ וחמוץ [.1 וחומץ] קצת זכר לתפוח שעוררנו תחתיו ועב זכר לטיט ובירושל’ איכ׳ מ֗ד֗ צריך לעשותו דק זכר לדם ונר׳ לרם מלונדרש שלפיכך עושהו עב בתחלה ובשעת טבול נותנין בו משקין והוי כמר וכמר. We need but compare this with Zidkiah b. Abraham’s recipe, to notice the difference of national usage, even in this trifling detail. In England, all the fruits named in the Song of Songs—dates, figs, pomegranates, nuts and apples—were crushed with almonds and moistened with vinegar. In Italy, spices, vegetables, blossoms, and even a sprinkling of lime formed some of the ingredients of the paste. R. Moses of London, quoted in this connection, appears here as an unquestioned authority for the Seder ritual. For the first time, an English Rabbi, a master in Halacha and an authority in traditions, confronts us as a living personality and not merely a nominis umbra. R. Moses’ decisions were recognised even when opposed to the pronouncements of such great French teachers as the famous R. Isaac b. Abraham=Isaac of Dampierre, brother of R. Simson of Sens, who, by the way, was known in England by the abbreviation ריברא, not ריבא or ריצבא. As in France, they relied for their knowledge of the Seder ceremonies on such revered teachers as R. Solomon b. Isaac of Troyes, R. Joseph Tob Elem and others, who worked out arrangements of the Seder ritual, in prose and verse; so R. Moses of London stood out as the central authority in tradition for the whole of England. Most probably he also left a compilation of the rules appertaining to this service, which Jacob b. Judah possessed in manuscript, just as he left compilations of other ritual laws, e.g. :— הלכות מליחת בשר וכל הדינים כאשר סדרם רבינו מלונדרושא ת׳נ׳ב׳ה (Bodleian Library, codex 882). The form of the questions exhibits no difference whatever, except that אנחנו is used throughout instead of אנו. L. Hoffmann in Berliner’s Magazin13,193, note 1. is wanting; מצוה לספר alone is found. The passage concerning the night spent in Bené Brak, which is only known from the Agada—its original source being still undiscovered—arranges the names in the following order:— מעשה ב֗ר֗ אליעז֗ בן עזריה ור֗ אלע֗ ורבי יהושע ור֗ עקיבא ור֗ טרפון. It only reads כל הלילה. The wise son says, in contradistinction to his wicked counterpart:— אשר צוה יי’ אלהינו אותנו ואפ, as, indeed the Mechilta and all ancient texts of the Agada read (comp. Hoffmann in Berliner’s Magazin, 13,193). The speech put into the mouth of the רשע has the readings:— שאילו היה שם ,שהוציא עצמו. In the fourth son’s speech לאמר is omitted. The piece יכול contains the reading:— לא אמרתי לך. After ברוך שומר it is said:— ב״ה ב׳׳ש שהק֗ חשב לגלות הקץ כמה שאמ׳. In the following passage the reading is:— זו החרב שנ׳, דבר אחר ביד חזקה ובזרוע נטועה שתים ובאתת ,זו נלד שכינה של ,מהו או׳ ,מנין שלקו המצריים ,שתים ובמורא נתל שתים ובמפתים שתים אמור מעתה ,ואל הים מהו או ,אצבע אלהים הוא זה is wanting. For הקדוש ברוך הוא, the reading throughout is ‘הק. In כמה מעלות the single variant is לנו ממונם. The piece commencing ר’ גמליאל varies:— שלשה ,ר׳ל או׳ בזמן שבית המקדש קים ,אלו הן ,דברים הללו is wanting. במצרים ,על שום שפסח המקום על בתי בני ישר׳ שנ׳ before בנגפו is wanting. ולברך ,חייבין ,ויגבי֨ה כ֨ל אח֨ד כוס֨ו יא֨מ׳ :‏ לפיכך is wanting. ומאפלה לאור גדול ומאבל לי״ט ,שעשה נסים לאבותינו is wanting. Against the tradition in Ibn Jarchi (המנהיג, Pesach, p. 75), the conclusion here reads:— ונאמר לפניו שיר חדש הללויה. After למעינו מים, the direction is given ואומ׳ בע֨ל הבי֨ת. In the blessing מן הפסחים ומן הזבחים לכשיגיע ,והגיענו הלילה הזה. Before מן המצר the direction is given:— ויע֨נו המסוב֨י׳ הודו בכל פסוק, and before מיכאן ואילך כופל—אבן מאסו. Dávid Kaufmann. “The Ritual of the Seder and the Agada of the English Jews before the Expulsion.” The Jewish Quarterly Review, Vol. 4, No. 4 (Jul., 1892), pp. 550-561. We are grateful to the University of Pennsylvania Press and Center for Advanced Judaic Studies, University of Pennsylvania for making access to this Public Domain work available. Transcription and preparation by Aharon Varady — Shgiyot mi yavin, Ministarot Nakeni שְׁגִיאוֹת מִי־יָבִין; מִנִּסְתָּרוֹת נַקֵּנִי “Who can know all one’s flaws? From hidden errors, correct me” (Psalms 19:13). In honor of Pesaḥ this year, I’ve transcribed “The Ritual of the Seder and the Agada of the English Jews before the Expulsion” by Dr. Dávid Kaufmann (1852-1899) which first appeared in The Jewish Quarterly Review, Vol. 4, No. 4 (Jul., 1892), pp. 550-561. 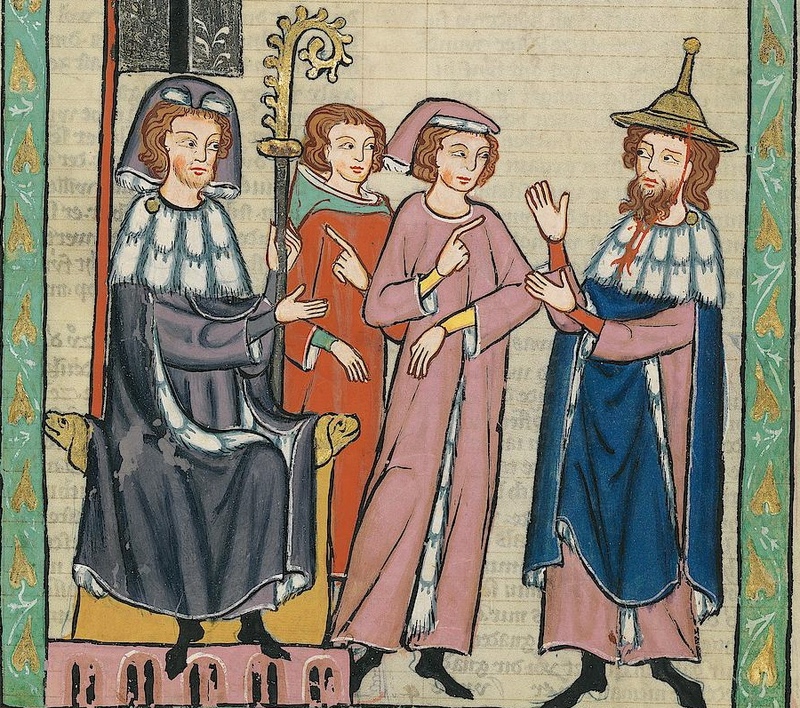 In the article, Kaufmann describes an English Haggadah contained in an extremely rare manuscript, the Etz Ḥaim by R’ Jacob b. Jehuda of London, a singular witness to the English liturgical tradition prior to King Edward I’s Edict of Expulsion in 1290. In this and another article on the Etz Ḥaim, Kaufmann clearly hopes the manuscript will be published and more widely accessible to scholars. Preserved in a German library before the Shoah, we are not certain where this manuscript is preserved today (if it survived the war). If you know it’s wherabouts please share your knowledge, and if you would like to help translate this work in reconstructing what an English Haggadah might have read like in the 13th century, please share your work. 1. Solomon b. Jehuda, the saint of Dreuæ (see Gross, Revue des Études Juives, XIII, 46, No. 3), followed this custom of translating the Hagada into the vernacular, so Samuel of Falaise reports, as quoted by R. Isaac, Or Sarua, 119a והקדוש מדרי׳׳וש היה רגיל לומר בלע׳ז עד כולנו מסובין. 2. Or Sarua, II., 119b. 3. מחזור ויטרי, ed. Hurwitz, p. 274, note א. 5. Pesachim, 114b; Machzor Vitry p. 284. 6. Ibn Jarchi, המנהיג Pesach, § 69. 8. Ib., p. 271, note א. 9. L. Hoffmann in Berliner’s Magazin13,193, note 1. 10. The objection to this deduction in Machzor Vitry, p. 293, is corrupt. Instead of ואותו כקל וחומר, left by Hurwitz uncorrected, we should read ואותו קל וחומר האמור והלא עבדיו מקיפין אותו כדי שלא ימצא צער ……בגופו ואתה מלך בו, [מופרך הוא] אטו מי ; comp. הליכות קדם, p. 41. 13. שבלי הלקט, ib. ; המנהיג, Pesach, § 67. 14. המנהיג, Pesach, § 82. 15. Ib., §. 79. and Pesachim, f. 116a. 16. What is here related in the name of R. Menachem, the saint of Joigny, Isaac, Or Sarua (II., 119b), tells in the name of R. Jom Tob of Joigny, the martyr of York. See Z. Cahn, Revue des Études Juives, III. 4. 17. המנהיג, Pesach. § 86. 19. Arachin, f. 10a (Tosafot, s. v. י״ח). Cf. Berachot, f. 14a, Tosafot, s. v. ובלילי פסחים יש שמברכין פעמיס ובתחלה לקרות ואחר הסעודה אחר שפוך מברכין לגמור. 20. Tosafot Pesachim, f. 118a, s. v. רבי יוחנן. 21. G. Bikell, Messe u. Pascha, p. 81, thinks that the fifth cup is first mentioned in the 10th century. He has overlooked the fact that in the Boraitha Pesachim, 118a, the old reading is כוס חמשי. See Siddur Rav Amram I., שבלי הלקט. מיא, p. 200; Joseph Caro. Tur Orach Chaim. 481. “הגדה לסדר פסח | The Ritual of the Seder and the Agada of the English Jews Before the Expulsion (1287)” is shared by Dávid Kaufmann with a Creative Commons Public Domain Dedication 1.0 Universal license. David Kaufmann (June 7, 1852–July 6, 1899) (Hebrew: דוד קויפמן) was a Jewish-Austrian scholar born at Kojetín, Moravia (now in the Czech Republic). From 1861 to 1867 he attended the gymnasium at Kroměříž, Moravia, where he studied the Bible and Talmud with Jacob Brüll, rabbi of Kojetín, and with the latter's son Nehemiah. He was also an active member of the Meḳiẓe Nirdamim, a society for the publication of old Hebrew manuscripts. Kaufmann was the possessor of a large library, which contained many valuable manuscripts, incunabula, and first editions, and of which the Marco Mortara library, acquired by Kaufmann, formed the nucleus. Please reciprocate for any adaptation or redistribution of this work by (1) properly attributing the work to Dávid Kaufmann, (2) clearly indicating the date you accessed the resource and whether any changes have been made (and if so, please be in touch with us and leave a comment below so that we might note your adaptation or improvement), (3) providing a link back to this source, and (4) specifying the Creative Commons Zero (CC 0) Universal license a Public Domain dedication under which this work was shared. 2012-04-05 – 14 Nisan 5772 at 12:35 pm · Reply. Thanks to a reference found in Richard Sarrason’s “The Persistence and Trajectories of Penitential Prayer in Rabbinic Judaism,” I found that the Eits Ḥayyim by Jacob b. Jehudah Hazan of London can be found was reprinted in the 1960s and published in three volumes (ed. Israel Brodie; 3 vols. ; Jerusalem: Mossad Harav Kook, 1962-67).